Well, it’s been a while since my last post… I recently took a part time job working as a cook in a restaurant, so now I’m working two jobs, going to culinary school, and making sure there’s quality time with the family in there with all of that going on. Can we say busy? Whew! But, it’s amazing how much more I’m learning about cooking just by being in the environment itself. I’ve been making this recipe for several months now, and always happily gobble it down. During the day, I eat very healthy. All the sinful goodies are saved for the evenings and weekends, and it has proven to be a happy balance for me. So, I’m always looking for a healthy alternative to different recipes. 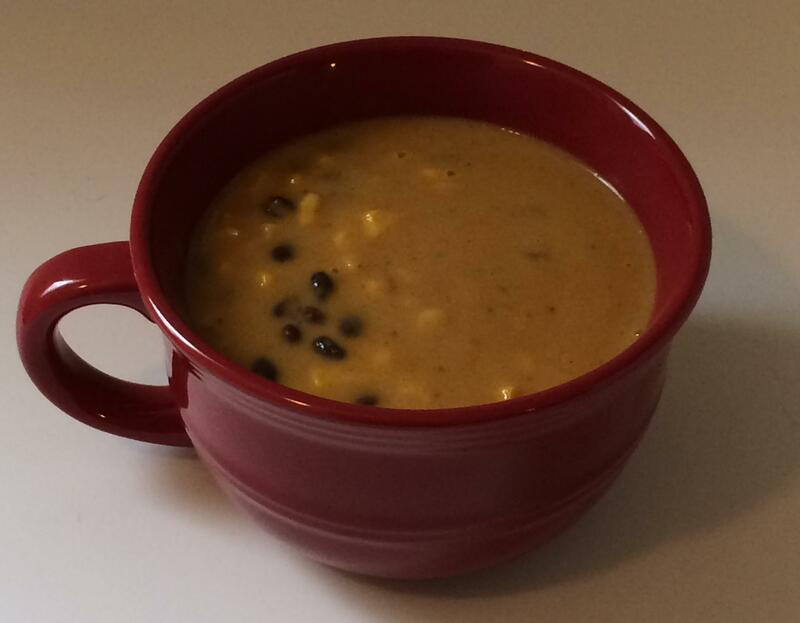 This recipe is a vegetarian/vegan twist of Chicken Tortilla Soup. I actually came across putting this together when I was working on a sauce for one of my final exams in culinary school while pureeing the first five ingredients. I loved the taste of this so much, that I decided to turn this into a soup. So, if you love tortilla soup, but want it more of a vegetable base, here you go! Usually when I make this, I’ll portion it into smaller containers and freeze it. This way, when you’re ready to have some, there is plenty in the freezer waiting. You can either thaw it out in the fridge in advance, or directly put it in the microwave. I’d recommend thawing it out some first though, because the cooking process isn’t as long. This has become a regular in my household, and is made every couple of weeks. Who knew something so healthy could taste so delicious?! Heat oil in stock pot at medium heat. Add onions and garlic once oil is hot, sauté until tender. Add poblano pepper and corn tortilla, cook for another five minutes. Add two cups of the vegetable broth, simmer for about 10 minutes. Remove to bowl to cool slightly, then puree in blender for about 1 minute, or until mixture is smooth. To stock pot, add tomato sauce, remaining vegetable broth, and frozen corn. Return to medium heat, add pureed mixture and stir well. Continue cooking for about 10 minutes, add black beans, salt and pepper. Continue cooking until corn is tender and soup is thoroughly heated through. Can be stored in refrigerator or freezer.